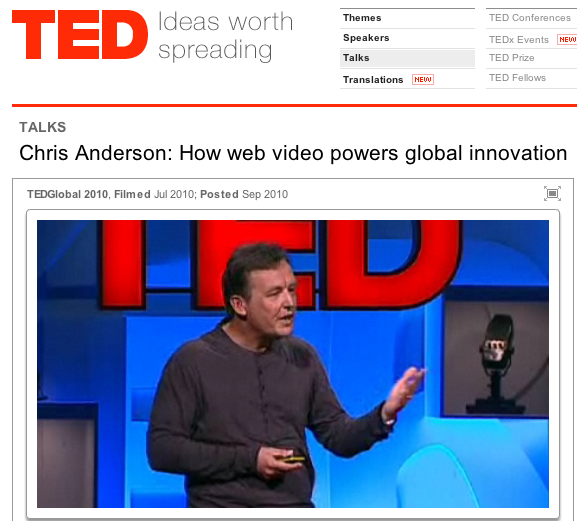 This isn't brand new, but I continue to be inspired by this gem of a TED Talk given by Chris Anderson that explores how online video has introduced a new platform for niche innovation to spread ideas around the world. His premise is this: now that video is accessible nearly everywhere, it is cheap to produce, and can serve any niche subject, no matter how small, we've seen a new phenomenon emerge. He calls it Crowd Accelerated Innovation. He argues that online video is presenting unique opportunities for innovation because it gives the crowd a desire to bring to light the best of their work, which in turn inspires further innovation. Anderson presents a few great examples, namely how online video is actually fueling evolutions in dance moves. He cites Jonathan Chu, who began to notice that dancers were learning from, iterating on, and improving upon moves from other dancers online. That eventually led Chu to recruit the best of the best for a dance troupe: The League of Extraordinary Dancers (LXD). "Reading and writing are actually relatively recent inventions. Face-to-face communication has been fine-tuned by millions of years of evolution. That's what's made it into this mysterious, powerful thing it is. Someone speaks, there's resonance in all these receiving brains,the whole group acts together. I mean, this is the connective tissue of the human superorganism in action." TED practices what it preaches, too. While their live events are pretty expensive and exclusive (and well worth it), they've also made their informative and inspiring talks available to audiences everywhere using online video. And like the dancers, the popularity of certain presentations on TED has essentially "stepped the game up" for presentation formats and delivery style elsewhere. If you could use a little inspiration for how you could "step up our game," be sure to check out the TED talk. How are you using video to inspire niche, passionate audiences?